I haven't made gak all year. How did that happen? Gak has been a staple in my classroom since 1998 since I was introduced to it at the Cooperative Children's Center in Seattle. Yet, here it is, almost February and my students haven't touched the magical stuff. I had promised myself and a student that I would make it this week, and by Thursday we'd had a holiday (Thank you MLKJr! ), a tired day (thanks to a busy weekend, and a board meeting) a late start (no thanks to you icy roads) and then it was Thursday AM, my chosen mobile mac lab morning. So- I had a choice, mac lab or GAK? Well, I decided on a whim to combine them. Usually I have 23 kids, usually I have a high-school aide or a volunteer at 10 am. Well, this day I had 11 kids absent thanks to many viruses and bacteria floating around our school. And my student helper was not available. So, I decided I could handle a science lesson, 12 kiddos AND the mac lab on my own. Was I crazy? No. It went great, or well as great as any activity with 5&6 year olds can go. 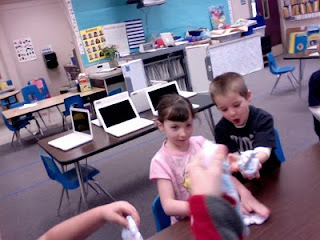 I introduced the materials, water, borax, and glue. I asked the kids about the substances and we discussed whether any of them could be played with. Then, I began to measure out the materials and we combined them (letting the kids help). They watched in amazement as solid and liquid and heat caused a chemical reaction to make a new substance. 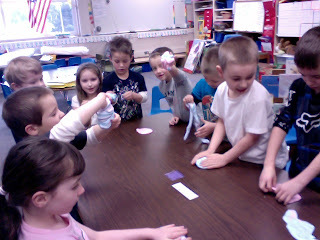 We had fun; we did science, math, and used technology all in one hour and it was relatively painless! I challenge you to share one of your great but simple lessons with me now! For those of you who haven't experienced GAK yet (really???) add literature to the lesson and read Dr. Seuss' Bartholomew and the Oobleck- it's really not gak in the story but close enough. Oobleck receipe first (no heat necessary) It also acts like a liquid until pressure is applied. It is messier than the gak though, really. Most liquids' viscosity changes because of temperature. But non-Newtonian fluids' viscosity changes because of pressure. Scientists haven't decided yet what makes oobleck behave like this. Mix the contents of the two bowls together kneading until it is fully combined. Discard any remaining liquid.